We love dog daycare! You will not hear that from all dog behavior and training professionals. Some will highly discourage you from enrolling your dog. Not us, instead we’re going to do all we can to help you weed through the good and not so good. Just like anything else in life, not all doggy daycares are the same. We’ve met some top notch providers over the years and they all have certain basics covered. Whether you are looking for a dog daycare provider for your dog while you are away on vacation, or daily while you are at work, it’s important to choose an experienced provider to be sure your dog is safe and well cared for while you are away. Prior to founding DogSense Unleashed, we owned a dog daycare in Eagan, MN, serving over 2,000 dogs and dog parents. Since then, we’ve consulted with a variety of dog daycares on industry best practices. It’s important to know that dog daycare is not appropriate for all dogs. Your first day of attendance at a dog daycare is an evaluation day. Be sure to ask questions about your dog’s first evaluation day and a description of the facility’s policies. Vaccinations will need to be current, including: Rabies, Distemper and Bordatella. (Some daycare facilities will accept titers test). What education in animal behavior and modification are employees required to have or provided by the dog daycare? The best run daycares we have personally come across have individuals with education from my alma matar “The Academy for Dog Trainers” and credentials earned through “The Dog Gurus”. We suggest looking for a daycare with some formal training requirements of staff interacting with and charged for the care of the dogs in off leash play. What is the ratio of human to dogs? 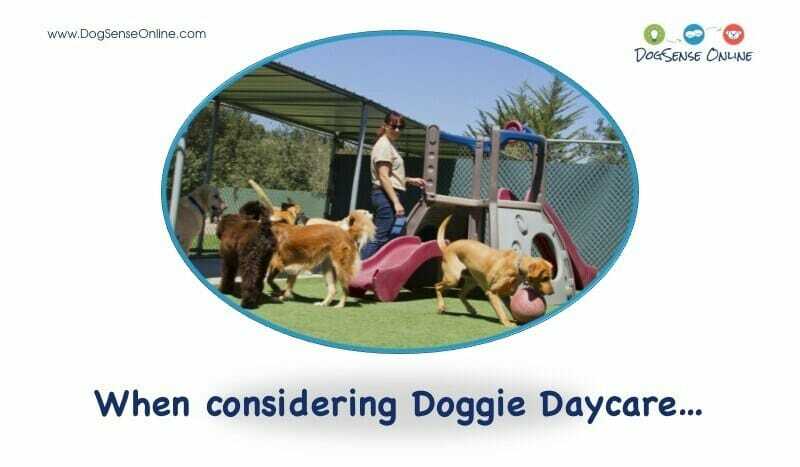 We suggest looking for a daycare that operates with one person per 12-15 dogs in playrooms at all times. What is their dog to square foot playroom space ratio? We suggest looking for no less than 70-100 square feet. Overcrowding causes more fights, there is just no way around it. Indoor overcrowding is even more difficult on dogs, if your dog is shy at all, this will not provide a pleasurable experience for your dog. Is a trained staff member present in the room with dogs at all times? There is no wiggle room here when it comes to safety, accept nothing less than “at all times”. What methods are used for behavior problems? Understand that there are significant risks for side effects in behavior when aversives such as citronella collars, loud noises and scruff grabs or shakes are employed. Alpha rolls, shock collars, pinch or choke collars should never be used or recommended under no circumstances. Redirects are at highest risk when these are employed in off leash play. You may read the American Veterinary Society for Animal Behavior Position Statement on punishment at this link. You do not want to risk these things for your dog. Reward based training is the way to go! What types of rewards are used for teaching desired behaviors? Unfortunately, dog daycares that use food, play and/or toy rewards in the playroom are a bit hard to come by…this is changing as better education is disseminated and obtained. Motivation is required for behavior modification. Behavior change can happen with the use of rewards such as food, play and attention or it can be done through using pain, force and intimidation. The latter poses significant risk. We only recommend dog daycares that employ methods that use giving of rewards for behavior they wish to see more and removal of rewards for decreasing unwanted behavior. Do the dogs have a structured day and a nap time? You do not want your dog in a high arousal, stimulated environment for 8-10 hours in one day. It’s just too much. They need a break to slow down for a bit and rest. Do the dogs wear collar or any equipment during play? Some daycares go completely naked with all dogs and some require a quick release collar. Both are of sound practice. Dogs should not be wearing shock, pinch or choke collars ever. Request to see the written protocol for breaking up a dog fight? Well run daycares have supplies listed that are always on hand in case of a fight. If they do not have formal policies and procedures for this for their employees, I would suggest not using that daycare. Are the dogs separated into various play groups? We recommend multiple play rooms versus a one room play all style. Dogs will be divided into appropriate play groups based on size, temperament and play style. Building is temperature controlled year round. Thorough cleaning is maintained daily. Double-gated entries are in place for all playrooms. An emergency evacuation plan is in place with periodic training for staff. Puppies are not accepted until at least 16 weeks of age, unless they have a special room only for puppies and selected adult dogs for tolerance of puppies. Doggy Daycare is a magnificent option for exercise and enrichment for your dog…let’s always play safe and be thoughtful when choosing a provider for the safety and well being of all of our dogs! For a list of daycares that follow the best industry standards, check out The Dog Guru’s list for a dog daycare provider in your area. Robin and Susan are hands down the best in the industry! They provide the most thorough educational tool for all dog daycare handlers, ensuring the best care for your furry friend. In St. Paul, MN you’ll never go wrong with Dog Days Inc with 3 convenient locations. In Minneapolis, MN, Metro Dogs Daycare & Boarding will always give your dog great care. P.P.S. Don’t miss our local services in Minneapolis, Minnetonka & Edina, MN areas providing In Home Puppy & Dog Training in Minnetonka, Minneapolis & Edina, MN and Puppy Classes in South Minneapolis, MN for the social family dog.